Huge increase for the month, right? Don’t get too excited! I had actually forgot about the extra money that I had allocated from my paycheck to go into my TD Bank account last month, so it looked worse because my main checking account still had all those payments. So there was a missing $2500 from last month’s calculations (whoops). I didn’t actually find a large sum of money hidden underneath the sofa. Even if you don’t include that, it was still a great month for building up money within the checking account. Savings account includes two automatic transfers and the minimal amount of interest that I receive. All of my market accounts grew this past month, whether it was from contributions, market growth, or a combination of both. Always nice to see everything on the positive side of things. And while the increases were huge this month, I expect that to balance out next month. I have a very large credit card bill incoming thanks to a vacation in June, so I’d expect my checking account to either stay flat or take a small dip. 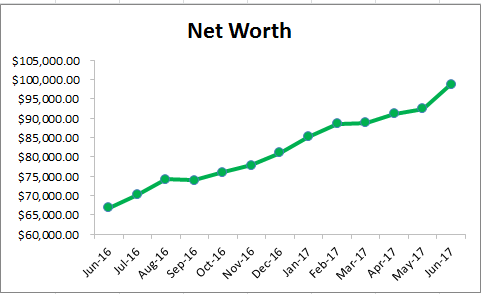 If the market continues at the current rate, I’m thinking that I should be able to hit a six figure net worth though! Next step is to increase the 401k contribution, as my checking and savings accounts have way more money in them then required for an emergency fund. 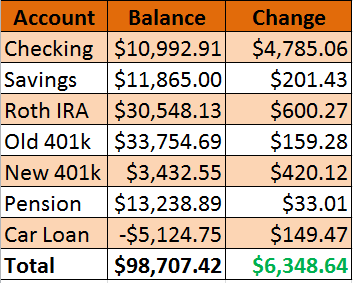 I’m continually spending less than I make, and I’d rather put that money to work for me in my 401k than just sit in accounts that make 1% or less than 1% interest. I met my goal of hitting 3 years worth of spending for June! We’ll see how long it stays above that threshold with Summer spending making the average creep up, but it feels good that I was able to at least make that happen. 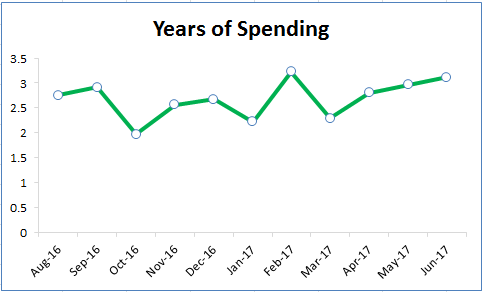 I know I hit that back in February, but that was before I was using average spending to calculate – and spending in February was super low compared to the rest of the months. I also thought it would be cool to see the opposite, how much would I be able to withdraw each month? I set the rate of return at 4% as a conservative guess, and the retirement time period would be for 30 years. I’d be able to withdraw $469 a month for 30 years which is 17.7% of my average monthly spending.